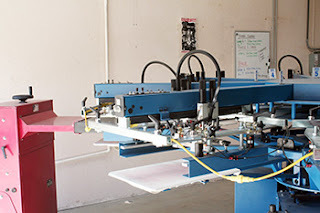 When a design is produced using the screen printing method, actual screens are used in the process! Essentially, this screen is cut to make a stencil for the design. Ink is then spread over the screen, passing through to the object underneath only in the areas you want it to be. Only one color per screen can be used - so depending on the number of colors in the design, you’ll need multiple screens to produce the final item. Screen printing is the best way to put an amazing custom screen printed shirt design on a piece of clothing, and here at IDG screen printing in Palm Desert we handle the entire custom screen printed t shirt design process right on site! First we do the design work, making sure your graphics look great and will print perfectly on our quality screen printing products. If you only have an idea of what you want, our design team will personally guide you through creating a great design for your screen printed products. Next we'll help you pick the right product to put it on, be it a custom t-shirt, hoodie, tote bag, or any of thousands of possibilities.